When temperatures rise, some of our elderly residents don’t always have the luxury of turning on a thermostat. 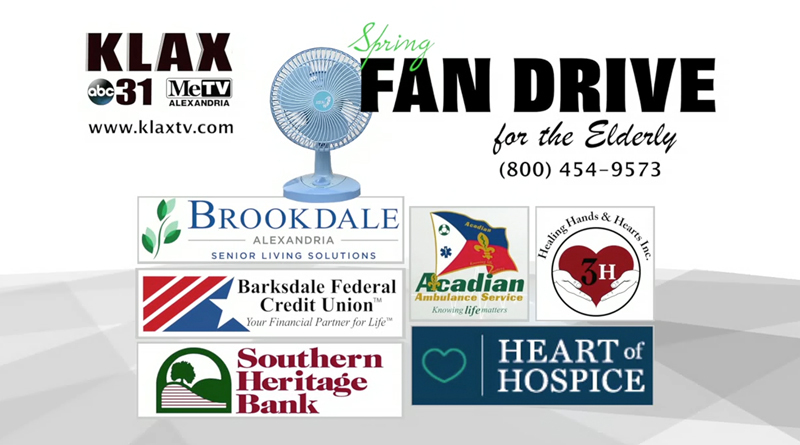 That’s why KLAX-TV and area businesses have teamed up to form the “Spring Fan Drive for the Elderly.” You can help by dropping off a new fan at a location in your parish. Fans will be collected and distributed by each parish’s council on aging provider. Remember, keeping cool isn’t something that comes easy for everyone; help us to bring some relief from the summer heat to those less fortunate. For more information, please call the CENLA Area Agency on Aging at 800-454-9573. Grant Council on Aging, Inc.
Rapides Council on Aging, Inc.
Rapides Senior Citizens’ Center, Inc.
Winn Council on Aging, Inc.